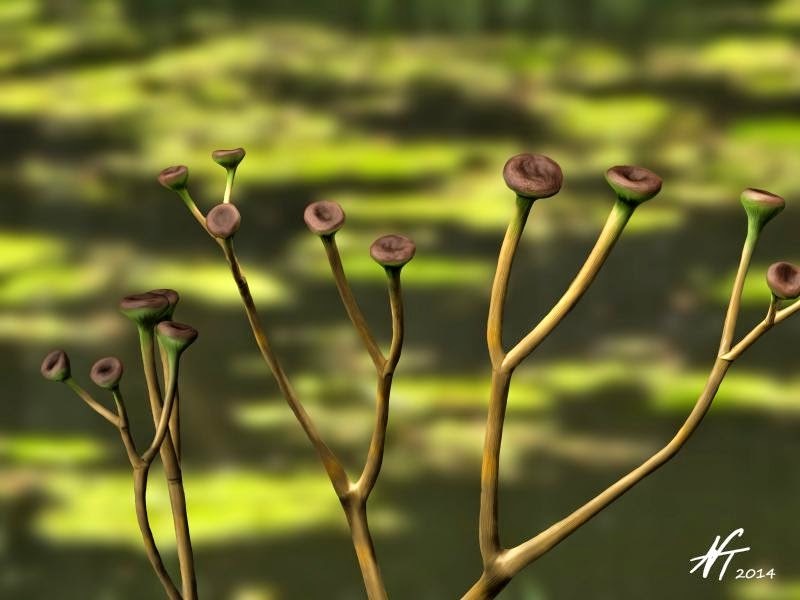 The first vascular plants evolved during the Silurian. They were the ancestors of nearly all modern land plants, and their emergence was a major evolutionary event. The first animals to go up on land also evolved during the Silurian. The biggest news in the oceans was the evolution of fish with jaws and teeth instead of a simple hole for a mouth. Plants had already begun to colonize land during the Ordovician, but it was not until the Silurian that the first vascular plants evolved. Extending throughout a vascular plants are two types of veins constructed of long cylindrical cells. 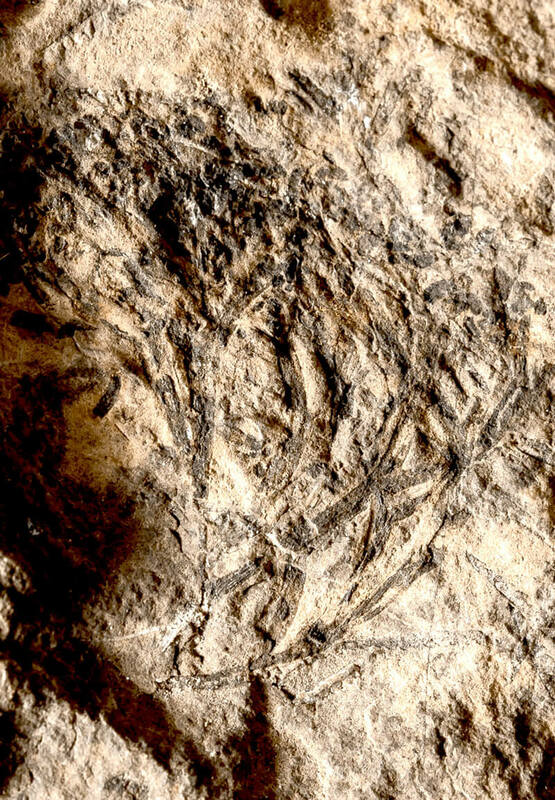 Fossil Cooksonia, one of the first, now extinct, vascular plants. One type of vein transports water and the other nutrients, to and from all parts of the plant. For example, water is taken up from soil via the roots and transported all the way up to the top of the plant. The evolution of these transport veins made it possible for green plants to begin colonizing habitats on land, with everything from the smallest flower to the tallest tree. 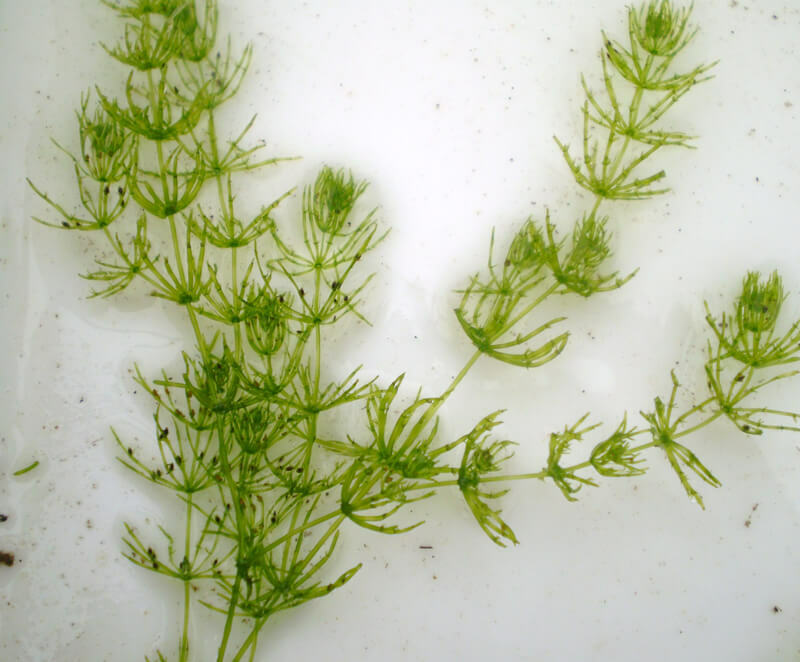 Modern stonewort, related to the first vascular plants. The first vascular plants were small, less than five centimetres high, and had no leaves and lived in damp environments. They belonged to an extinct group of species that have no close modern relatives. Their ancestors resembled today’s water-dwelling green algae called stoneworts. The very first vertebrates were fish that had no jaws or teeth to chew with. They sucked in nutrients from bottom sediments through their mouth holes or filtered food from the water. Early fish with mouth hole but no jaws or teeth. But something new occurred during the Silurian. Flexible jaws evolved, making it possible for vertebrates to swallow larger prey. They could live as predators. Armoured fish called placoderms were the first vertebrates with jaws. They appeared during the late Silurian, reached their high point during the Devonian, and became extinct during the mass extinction which ended that period. This placoderm is from the Devonian, but such armoured fish evolved during the Silurian. Several other groups of fish with teeth evolved during the Silurian. Today, nearly all fish on Earth have teeth and jaws. During the Silurian, land plants prepared the way for the first animals on land by providing a new source of food. The first land animals were fairly similar to their marine relatives, like the sea scorpion you can see here, and they probably lived both in water and on land. Scientists have discovered fossils of various mites and myriapods. They have also found traces of the first insects, which were related to the silverfish that sometimes infest bathrooms. Some animals fed on dead plant debris, while others were predators that hunted animals. Those that were hunted evolved various kinds of protection and defence in order to avoid being eaten. These adaptations stimulated a rapid increase in the pace of evolution, with a growing diversity of species in various environments. 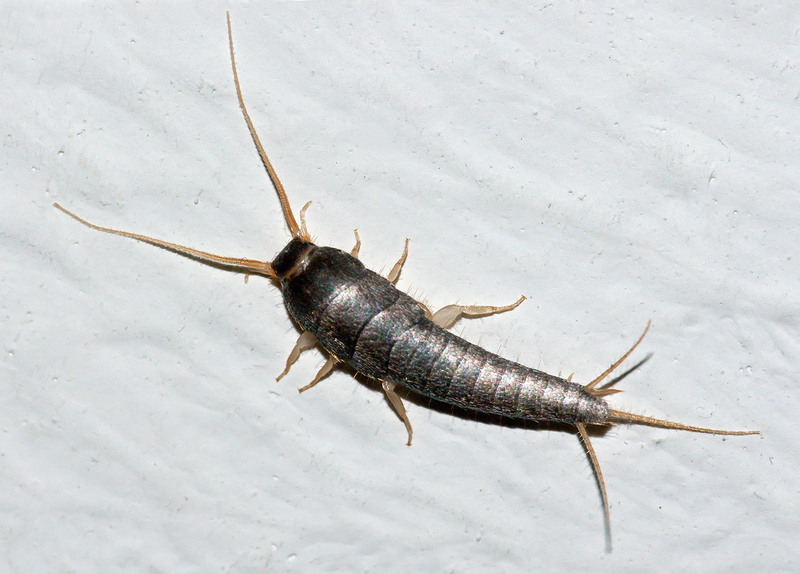 Silverfish, one of the Earth’s oldest insects. Perhaps there are some in your bathroom? And surely there are similarities to the sea scorpion above.